Noah participated in a keuring as a three-year-old stallion but was at a very "lanky" phase of his development and didn't make star. The judges encouraged us to bring him back when he had more fully matured: however, in the following year we had Noah gelded and there were no keurings then for young geldings. Noah turned 6 this past April. Noah is 16 hands 2 inches tall with a long mane, forelock, and tail. 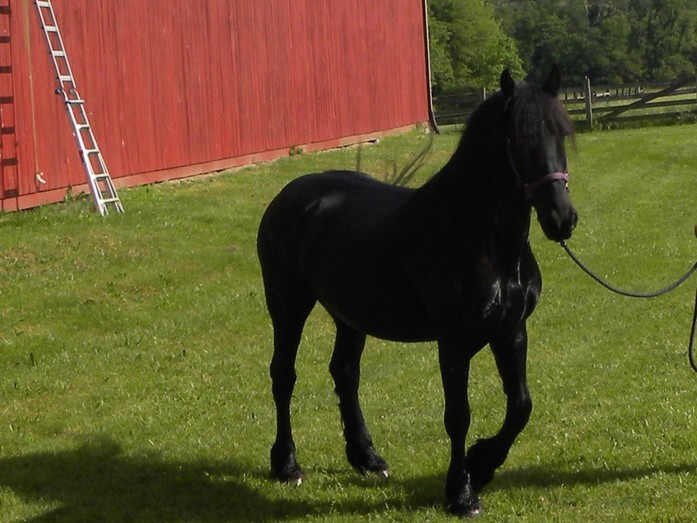 Noah has been professionally trained to ride and is forward moving with a long and powerful stride. He has excellent conformation and a willing, friendly personality. We currently have more horses to ride than time available so are interested in finding a good home for him where someone can enjoy taking him to his next potential.